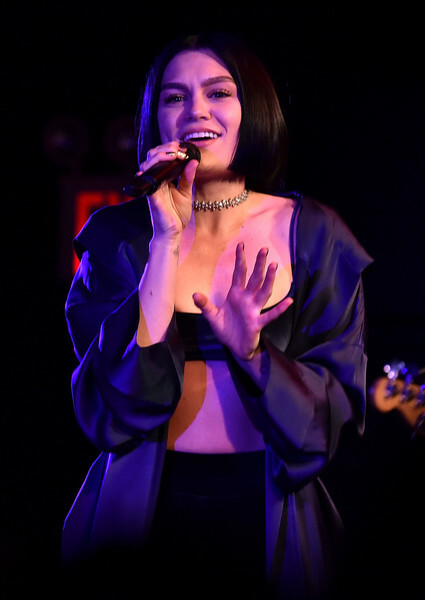 Last night we had the pleasure of watching British breakout superstar Jessie J take over NYC as she closed out her sold out R.O.S.E Tour held at Le Poisson Rouge. The intimate venue was jam packed with fans ,friends & media who have been waiting to see the sultry vocal powerhouse make her return to the stage after a brief absence. With a line wrapped around the block to see the shining star , it was clear that this show was the only place to be if you live in NYC. The soulful songstress hit the stage with a vengeance as if she hasn’t missed a beat and like the true performer that she is she gave us one hell of a show as she sang some of her fan favorite hits like ‘Who You Are’ , ‘Nobody’s Perfect’ , ‘ Mama Knows Best’ ,’Flashlight’ , ‘Masterpiece’ , ‘Thunder’ , ‘Price Tag’, ‘Bang Bang’ & ‘Do It Like A Dude’. Now of course those songs were expected and she gave us everything we were waiting for but her performance of her new material was even more impressive. Jessie briefly told the crowd that she was stuck in a place of confusion and just didn’t want to perform or record any music but thankfully she met DJ Camper who helped inspire her to create again and what came from it , is truly brilliant. Jessie put her heart into records like ‘Real Deal’ , ‘Think About That’ & ‘Not My Ex’ which showed such growth in her already magnetic show which kept the fans wanting more. If this is any indication of whats to come on her anticipated third album ‘R.O.S.E’ then the world is in for one hell of a musical masterpiece. If your weren’t able to catch her this go around check out footage from the show which is only available for a limited time, but trust me after watching you wont ever miss out on a Jessie J show if she comes to your city. Pics courtesy of Theo Wargo for Getty Images & Instagram.